Glenn Hochwalt, center, participates with others in the UVMC Delay the Disease program. TROY – Glenn Hochwalt thought participating in the new Delay the Disease wellness program would help him deal with his Parkinson’s disease symptoms. After completing the first session of the program, Hochwalt said the benefits have been more than he imagined. “I can’t speak highly enough of it. It kind of made me sad when it came to an end,” he said. The 12-week program at Upper Valley Medical Center will return in the fall. Hochwalt and his wife, Audrey, plan to be involved again. 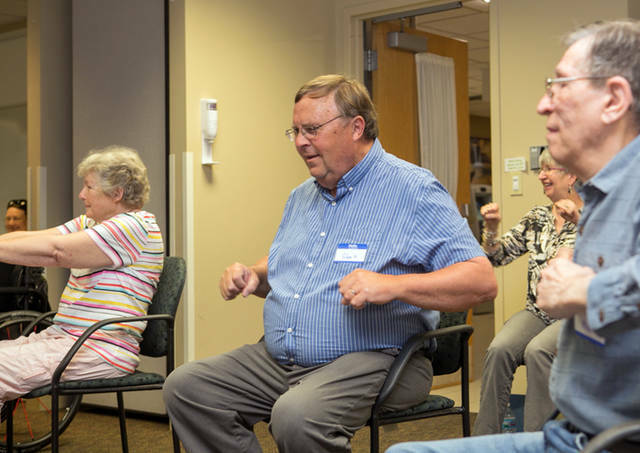 A resident of Bethel Township in Miami County, Hochwalt was referred to the program by physical therapists at UVMC where he had participated in the LSVT BIG program that focuses on movements for daily living. “Delay the Disease fit right in for me because it reinforced LSVT and gave me the opportunity to practice some of the things learned and to learn new things to go along with it,” Hochwalt said. Hochwalt has dealt with symptoms of Parkinson’s disease for many years but was just recently fully diagnosed. His wife attended all Delay the Disease program sessions with him, participating in exercises as appropriate. “I figure I need exercise, too, and it helps me help him exercise at home,” Audrey Hochwalt said. Each weekly class lasted one hour. Areas of concentration were common issues faced by those with Parkinson’s such as walking, swinging arms and turning one’s head. “She worked on all of those things for people like us who are mobile as well as those who have to sit,” Glenn Hochwalt said. The UVMC physical therapist leading his sessions was Lauren Seger, who Hochwalt said would give individual help to participants throughout the room. Participants also learned how to increase their heart rate while sitting, to stretch and to work on challenges such as arm movement, hand movement and balance. For Glenn Hochwalt, areas of concentration were his arm movements along with his hands, which are affected by tremors. He is now able to gain better control of his arms and to swing them in sync with walking. “With the medication and exercises, I do pretty good except for my hands,” he said. A side benefit of participating in Delay the Disease has been exposure to those with Parkinson’s and education about the disease, the Hochwalts said. “We have talked with the others and learn from them,” Audrey Hochwalt said. A Parkinson’s disease seminar titled “Your Life with Parkinson’s Disease” will be offered at UVMC on July 24 from 6 p.m. to 7:15 p.m. Neurology specialists Rabindra Kitchener, M.D., and Lois Krousgrill, M.D., will be the featured speakers. UVMC physical therapists who specialize in treatment of Parkinson’s disease and are certified in Delay the Disease and LSVT BIG programs also will be present. To register for the seminar, call Carefinders at 1-866-608-FIND or register online at uvmc.com/Parkinson Seminar. For more information, call 937-440-7152. A new 12-week session of the Delay the Disease wellness program will begin Sept. 4. The program has been expanded to twice per week. To register for the wellness program, call Carefinders at 1-866-608-FIND or register online at uvmc.com/delaythediseasewellness.